Windows tablets are alive and well. Here we look at two upcoming offerings from Samsung. Not long ago, Samsung held the Galaxy & Ativ conference in London, where the Korean giant revealed a wide range of devices – from smartphones, to cameras and tablets. As the name of the conference suggests, this event hasn’t been all about the Android-powered Galaxy lineup. It’s also been an opportunity for Samsung to reveal a handful of Windows-powered devices, mainly from the tablet segment. Indeed, Windows tablets are pretty much alive and kicking, despite their rough start back in late 2012. This year, a new generation of slates backed by Microsoft’s OS is going to hit the market, and once again, Samsung is going to be one of the big players to support it. During the Galaxy & Ativ conference, the Korean manufacturer has unveiled two of its upcoming devices: the Samsung Ativ Q and the Samsung Ativ Tab 3. Let’s take a quick look at what these devices will have to offer once they become available. We’re fairly sure that most gadget enthusiasts are already somewhat familiar with the concept of a hybrid tablet. If not, then to put it briefly, a hybrid tablet usually arrives with some sort of physical keyboard, or support for a keyboard dock. ASUS is well known for its endeavors in this particular niche, being one of the manufacturers that have defined the term “hybrid tablets”. Samsung on the other hand hasn’t really offered anything of the sorts in the past, but times are changing. The recently announced Samsung Ativ Q tablet is truly a hybrid, not only from a design perspective, but also from a software standpoint. The Korean manufacturer wanted to take the concept of “hybrid” to a whole new level, and as such, the company came up with Ativ Q – a dual-boot device powered by both Windows 8 and Android. On the outside, the slate comes with its own physical keyboard which is concealed underneath the display. The screen slides out and can be positioned at various angles, giving users the possibility of using the tablet as a notebook or in the form of a stand. Hardware-wise, the Ativ Q is even more impressive. It features a 13.3 inch display with a resolution of 3200 x 1800, and runs on an Intel Haswell Core i5 CPU (which is accompanied by an Intel HD Graphics 4400 GPU). Additionally, there are 4 GB of DDR3L RAM on-board, 128 GB of SSD storage, a 720p front-facing camera and a battery that promises up to 9 hours worth of juice. 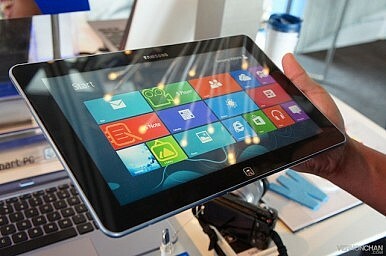 The tablet measures 13.9 mm in thickness and weighs 1.29 kg, making it a pretty interesting alternative to an ultrabook. Although the exact price of the Ativ Q hasn’t been revealed, given the impressive hardware specs, we can easily tell that the tablet in question is targeted at the high-end market segment, and should be priced accordingly. Nonetheless, Samsung has also unveiled the Ativ Tab 3 which should cover the more “affordable” market range, or at least, the less expensive one. The Ativ Tab 3 features a 10.1 inch display with a resolution of 1366 x 768, it’s powered by an Intel ATOM Z2760 processor and packs 2 GB of LPDDR2 RAM. Additionally, there are 64 GB of eMMC storage, a 720p HD front-facing camera and a battery that should last for 10 hours; at least according to Samsung’s spec sheet. The slate weighs 550 grams, it measures 8.2 mm in thickness, and last but not least, it arrives with an incorporated stylus. Overall, it’s nothing too out of the ordinary, but the best characteristic of the Ativ Tab 3 is probably the fact that it runs on Windows 8, and not Windows RT. This means that users will have the possibility to install legacy Windows programs (definitely a big plus in our book). Unlike the Ativ Q, the Samsung Ativ Tab 3 does not support dual-boot OS, so Android is not an option. Have you considered the possibility of buying a Windows-powered tablet this year? Do you think that this particular market has matured? Does it look worth a try? Which one of these tablets would you be willing to buy? Share your thoughts by leaving a comment below, and of course, don’t hesitate to describe your experience with previous Windows-powered tablets, if you have any. Let us know what changes and improvements you expect from this newer generation. In Myanmar, Jittery Investors Threaten Long-Term DevelopmentAsia’s Elections: Market Moving or More of the Same?Now Is a Critical Stage for China’s New Energy VehiclesThe Risk of E-Commerce Provisions in the RCEPMamarizo Nurmuratov: Uzbekistan’s Unsung Hero?